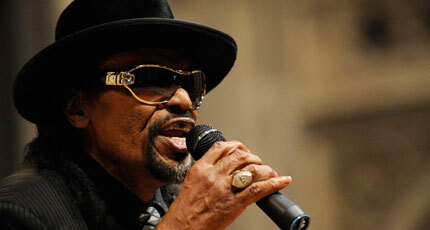 Chuck Brown talks about the Maverick Room, where he says go-go took off, and about his fans. WTOP's Neal Augenstein caught up with Chuck Brown five years ago. He remembers that meeting in this first-person account. Editor’s Note: WTOP’s Neal Augenstein caught up with Chuck Brown five years ago. He remembers that meeting in this first-person account. WASHINGTON – Few people achieve “living legend” status. Chuck Brown did. I interviewed the Godfather of go-go five years ago. More precisely, I tried to. Standing near the intersection of 4th St NW and Rhode Island Avenue, at the the site of the old Maverick Room, where he says “go-go really took off”, Chuck Brown was a fan magnet. Easily identifiable with a gold-toothed grin, large shades, hat and suit, it was impossible to go 2 minutes without a fan recognizing Chuck, and saying hello. With his gravely voice and laugh, he and fans traded recollections ranging back to the 1960s. Most of the fans clearly remembered the Chuck Brown shows they’d witnessed. “Better than I do,” Brown laughingly volunteered. Brown greeted, shook hands, and interacted with fans as though he clearly remembered them, patiently answering their “whatever happened to” questions about former band members or other entertainers they’d seen over the years. Five years before his death and the outpouring of affection, Chuck Brown’s words were prophetic.